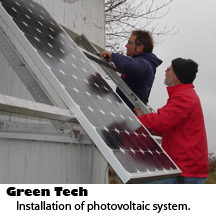 HOW TO GROW YOUR OWN GREEN BUSINESS FROM THE GROUND UP. From "mom-preneurs" to Boomers launching the dream business they always wanted, there are more people today yearning for a soul-nourishing business that celebrates our human spirit and potential than there are interviewing for a job. Small, sustainable and place-based businesses and the ecopreneurs who run them are becoming the very foundation of the emerging new green economy of the 21st Century. Increasingly, launching either for-profit or non-profit businesses are seen as the means to create a more sustainable and socially just tomorrow. 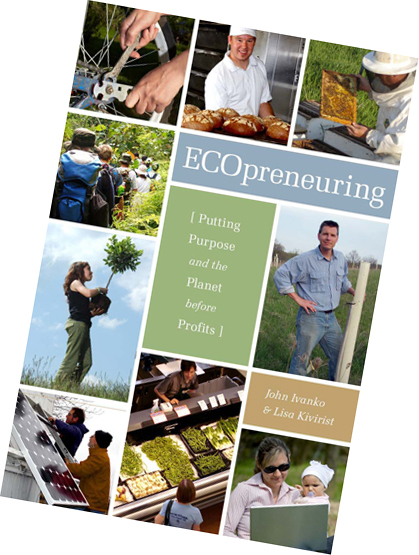 This accessible and inspiring guide includes Ecopreneur Profiles featuring businesses in both the non-profit and for-profit sectors of the green economy. ECOpreneuring is for any one of the many emerging businesses and enterprises thriving in a restorative economy: renewable energy generation, ecological restoration, pollution mitigation, sustainable food and fiber production, fair trade models, healthcare for a rapidly aging population, ecotourism, caring for communities in need, natural building, green design and greentech. ECOpreneuring demonstrates how we can earn our daily bread on a local or regional level while saving money, strengthening the economy and helping restore the planet to ecological health and social stability. Watch the "BETTER, not bigger" video short on YouTube, inspired by ECOpreneuring.